I should probably start with the back story - When I bought the house three and a half years ago one of the drawers was missing from the vanity. I have no idea why…Anyway, Ringo likes to play a game where he put his ball through the opening and then bugs me until I open the cabinet below so he can get his ball back. It’s really quite annoying, you would think that would have been enough motivation for me to start his project sooner…nope… So we just lived with a hole in the vanity for the past few years because I’m a procrastinator. As you can see, I decided to order all new drawer fronts because I wanted to make sure they all matched and I knew there was no way the replacement drawer would be identical to the old ones. I ordered my drawer fronts and box from Horizon Cabinet Door Co. The drawer fronts were $20 each and the drawer box was $18 with free shipping. I’m really happy with the quality and would definitely order from them again (the online ordering form was really easy to use too). Unfortunately, I haven’t installed any of them yet for a variety of reasons. First off, I need to cut a couple notches into the back of the new drawer so it fits the rollers, but I can’t find my jigsaw. Then the original drawer fell apart when I removed the old drawer front. I can repair it, but I need a new piece of wood to replace one of the sides. And the biggest issue is the false drawer front in the middle. It’s attached from the back with 12 wood screws! 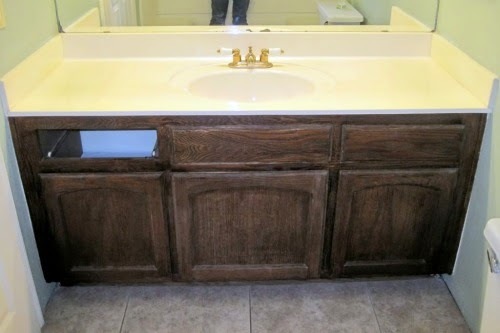 And the top six screws are angled so I can’t remove them without removing the countertop…and I can’t remove the countertop without disconnecting the plumbing and removing the caulking around the edges. I ordered a new countertop, but it’s not scheduled to be delivered until the end of the month. I guess I’ll just wait until then to remove the false drawer front and paint the cabinet. In the meantime (hopefully this week), I’m going to fix my other drawer issues and get them (plus the doors) painted. Despite all of that, I do have a little progress to share this week! I got the new hardware installed on the doors! I wanted to get everything drilled before I started painting in case I had to fill any mistakes, but thanks to my handy installation template I didn’t have any errors to fill (more details on installing cabinet hardware and how to use the template here). I picked these polished nickel Martha Stewart pulls from Home Depot for the drawers and doors. They kinda match my towel bar and toilet paper holder, even though those are a different brand from Lowe's. I also got my new shower curtain in the mail this week! It’s the botanical bird curtain from Target. It’s no longer in stores, so I had to order mine from eBay (it was $24.99). So far I’m really happy with my choice and I can’t wait to start buying the rest of the accessories for the room. Don't forget to check out the other linking participants here! 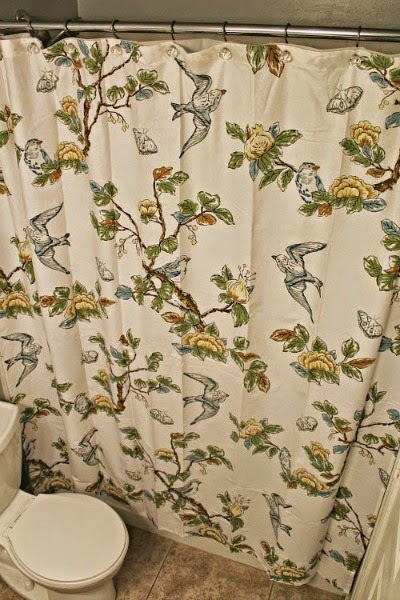 I love that shower curtain!! Looking forward to seeing more! The fabric on the curtain is so pretty and I can't wait to see the vanity all polished up! That door company looks like an amazing source! Love the fabric, too. You got a lot more done than I did! I had no idea you could order replace drawers like that, so awesome! I was cracking up about Ringo dropping the ball in the drawer and making you open the cabinet to get it out...totally something my dog would do too. He used to kick his tennis balls under the couch and make us get them. We no longer have tennis balls in the house haha. Can't wait to see your progress next week. I love your shower curtain. I saw the thumbnail picture on the link-up and had to come over and check it out!